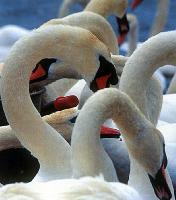 For over 600 years this colony of friendly mute swans has made its home at the Abbotsbury Sanctuary. Sheltered by the famous Chesil Beach, this ancient and special site provides protection for hundreds of nesting swans and their broods. Occasionally a visitor is allowed to hold a cygnet under the swanherd's strict supervision. Don't miss the spectacular mass feeding sessions at 12 noon and 4.00pm daily. Incredibly, from the end of May, you can wander safely around the nests, observing at close quarters the antics of the fluffy cygnets. An audio visual show about the Swannery runs hourly during the day. October (Season end): many swans move off site , influx of other wildfowl. Toilets, baby changing facilities and disabled toilets available at main entrance and coffee shop. None inside the Swannery itself. On the B3157 9 miles northwest of Weymouth. During the summer season a regular bus service runs daily from Weymouth.